Where do I begin...It's been a little while since I've posted. Don't judge, but it's been a little crazy. Basketball seasons started in November for both myself and my husband (yes, he started his first year at the Varsity level and loved it!). So with that...any given week Monday through Friday...we may have both been home before 9pm once a week! It was a little intense. My little seventh grade team finished 2nd in our conference with only 2 losses! They were fabulous!! In the classroom we've definitely been busy too! I'll stick with my Algebra I kiddos for this post. Some of the cool things they've been working on include a Car Interest Project (**Click here for the PDF instructions!! 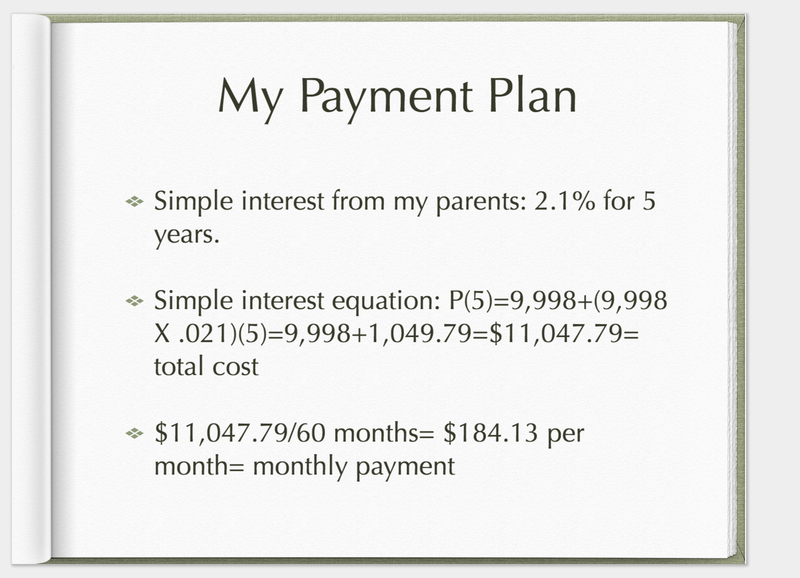 **) surrounding our study of Simple & Compound Interest (correlating with exponential vs. linear functions). For this assignment/project students were given various jobs that they may hold as a teenager when looking to purchase their first car. On their job card (**Click here for the Job Sheets! **), students were also given their pay per hour and their interest options whether simple interest from their parents or compound interest from the bank. 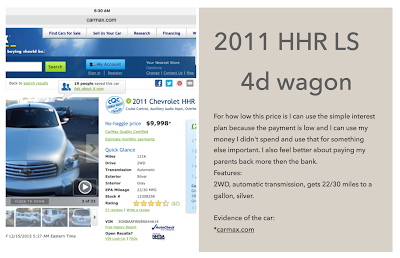 Students then researched various cars they could afford with their salary while taking into account their simple/compound interest payments. 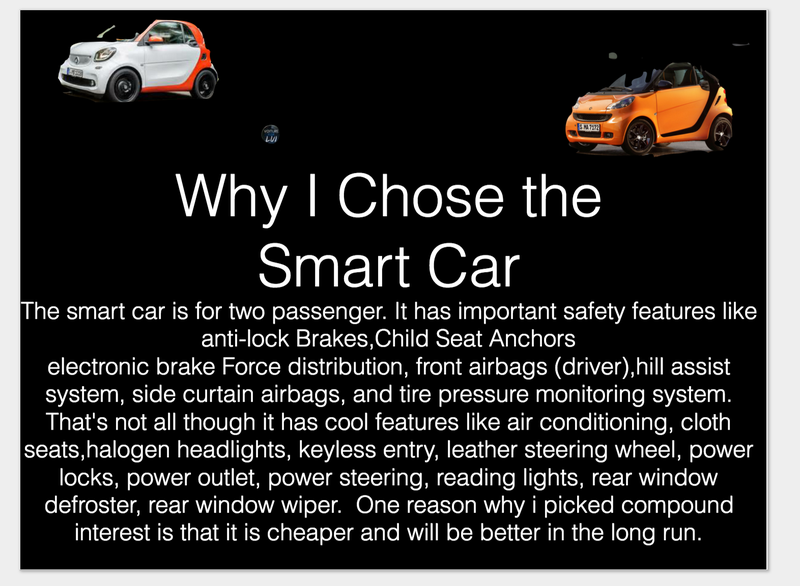 Once students figured out their simple and compound interest payments, they then had to decide which option they were going to chose to finance their car choice and create a presentation that would defend their choice by showing their findings. Students really seemed to enjoy this project. It was funny to hear them talk about the cars they wanted before getting their jobs. Many students were wanting the most expensive cars they could think of...then when they realized their yearly salary still wouldn't be able to afford their dream, it was interesting to see where they went next! 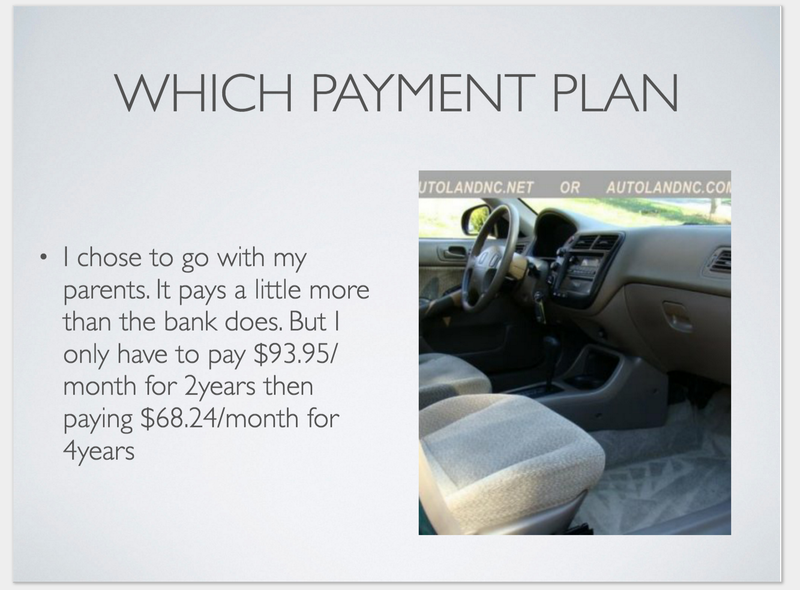 It was also fun to hear students talk about which was a better option...getting their payments over with in a shorter amount of time even though they would pay more monthly, or if they wanted to take a "cheaper" route and pay for their car longer with lower monthly payments. 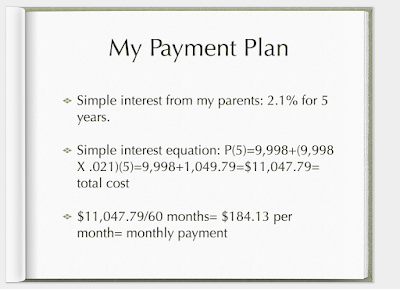 Overall I think students really liked this project, and it provided a great excuse for students to use simple and compound interest through real-world experiences! Algebra I students have also been working on graphing and solving Linear Systems. Students completed the same project we did last year where students were given one word problem and asked to solve the system through one of the methods studied in class: linear combinations, graphing, or substitution. Once students were given their problem, they were instructed to solve the problem in any way they chose, explain their variables, and defend the method of solving the problem they picked. 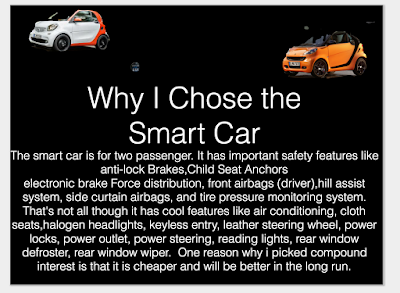 They completed this project through the Explain Everything APP. They seemed to do very well and enjoy this project as well! Station 1: With me for 20 minutes - Students in small groups (roughly 8-10 students...about half of the class) are centered around the board as we cover new material and concepts through our textbook. Station 2: Students work in small groups of three or four (two groups of 3 or 4 are doing this station at a time) to complete some skills practice problems from concepts/material covered the day before. This station is only 10 minutes long. Once the time limit is reached, students in this group switch with the Station 3 for 10 minutes before moving to my station for the last 20 minutes of class. Station 3: Students work in small groups of three or four (two groups of 3 or 4 are doing this station at a time) to complete an EdPuzzle specifically assigned to them. I pick and chose the EdPuzzles as well as the questions that are asked throughout them for students to complete. Concepts either cover previously covered material as a review, or new concepts as a pre-lesson for what I will teach either that day or the next. After 10 minutes in this station, students head to Station 2 before heading to my station for the last 20 minutes of class. I think this station thing has something special going on! The kids have spoken...and it looks like I'll be sticking to this for a while! I'll be sure to update how this turns out when it comes to test scores! 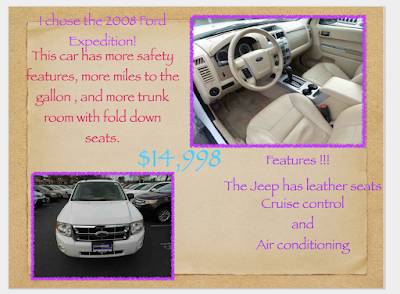 And one last little note before leaving this post...I have a little bragging to do. My 7th grade team from last year (currently the 8th grade) basketball team won their Conference Championship again this year! That's 2 years as Conference Champions. In two year this team has only lost 2 games (11-0 as 7th graders, 13-2 as 8th graders!). I would say that's pretty impressive. I can't wait to see what they do as high schoolers!